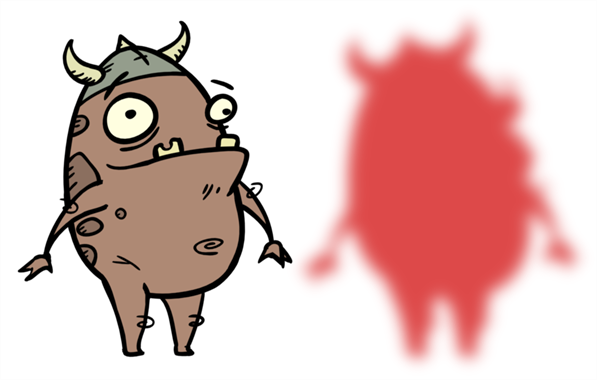 Use the Matte-Blur effect to blur a matte or change its colour. Here is an example of a network with the result of a Matte-Blur effect. 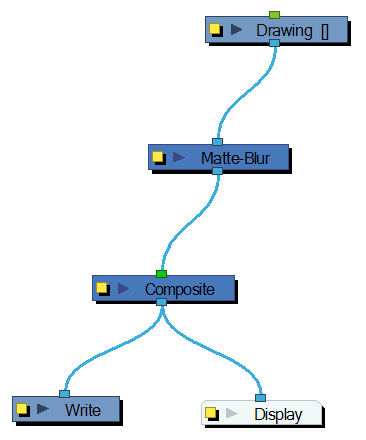 Use the Matte-Blur editor to control the output of the module. • Truck Factor: Activated by default, this option readjusts the blur when the element undergoes a change of depth or scale. When this option is disabled, the module's values remain unchanged regardless of depth or scale changes. It is recommended that this option be disabled when multiple drawings are composited and attached this module. • Blur Type (Directional or Radial): If Directional is selected, Harmony will blur the matte in the direction you select. If Radial is selected, Harmony will blur the edges of the matte evenly around points that make up the edge of the matte. 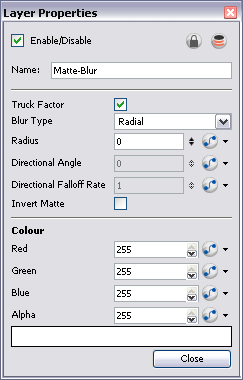 • Directional Angle: If you select a Directional-Blur Type, you can select the direction of the blur by entering a value from 0 to 360 in this field. • Invert Matte: Activate this option to invert the matte used to create the blur. • Red/Green/Blue/Alpha: In the RGBA fields, you can enter the value you want added to or subtracted from the colour channels in the drawings. Alternatively, you can attach these values to function columns. If you select the Pass Through option in the Layer Properties of a Composite where this effect is connected, the effect will be multiplied in areas where the drawing elements that the effect is acting on overlap.